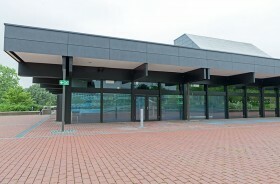 Inter­ac­tive Videoin­stal­la­tion projected onto the glass-facade of the building A3, Cross­build­ings (Kreuzbauten) in Bonn. Completed 2015. Inter­ak­tive fog-sculp­ture on the bank of the Nowa Motlawa, Stare Dolni in Gdansk/PL. 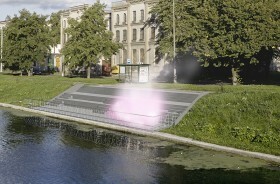 Designed 2012 for the Outdoor Gallery of the City of Gdańsk compe­ti­tion for the Laznia Centre of Contem­po­rary Art. Comple­tion planned, pending. 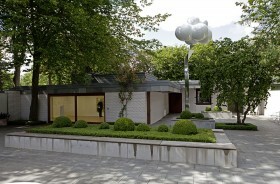 Designed 2010, real­ized in 2014 for the Mazovian Centre of Contem­po­rary Art - Elek­trownia in Radom, Poland. 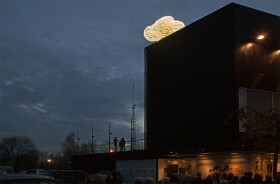 A three-dimen­sional light object made of 19 layers of curved neon contours, stacked hori­zon­tally on top of each other. The contours form a styl­ized cumulus cloud that rests on the very edge of the roof above the entrance of the new built museum. 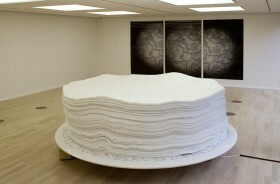 Stereo­scopic photo on lentic­ular foil, three panels, 360 x 180 cm, 2012. 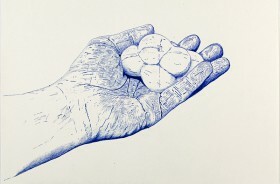 Group of draw­ings, ball­point on paper, 27 x 35 cm, produced between 2010 and 2012. 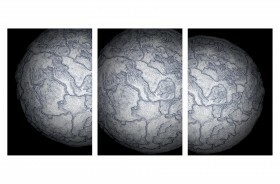 Group of draw­ings, ball­point on paper, 27 x 35 cm, produced between 2005 and 2011. 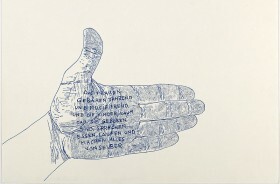 Blau Weiß (Blue white)—Group of draw­ings, ball­point on paper, 50 xi 50 cm, produced between 2005 and 2008. 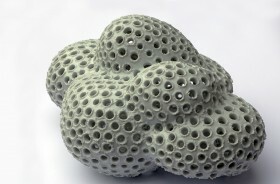 1:10 porce­lain model of the work Cumulus Berlin in an acrylic show­case measuring 31 x 21.5 x 16 cm as a limited edition object (edition of 5 copies), 2011. 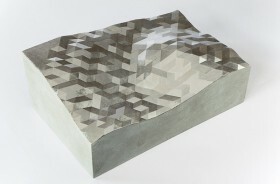 Silver-leaf 1:100 plastic model of the work 60°N 05°E (encased water­side) measuring 25.3 x 16 x 10 cm as a limited edition object (edition of 5 copies), 2012. 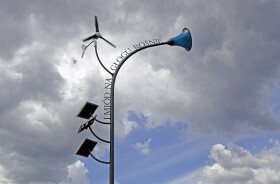 A recre­ated street light from the small town of Port Saint Mary on the Isle of Man, United Kingdom, 54°04’20.77“N 4°44’18.07W. 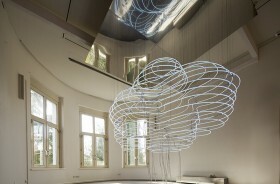 Aluminium, wood, plastic, fog gener­ator, 2012, height: 3 m.
Light object made from neon outlines suspended on thin steel ropes, lumi­nous blue, ca. 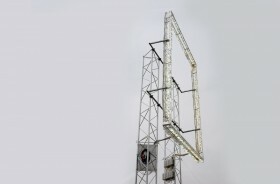 300 x 210 x 160 cm, chrome-plated steel sheets, 2011. Two channel video projec­tion on opposing panels, DV PAL, 8:30 hrs and 6:15 hrs. 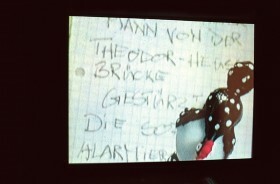 Produced during a 3-month stay in Wies­baden, Germany, in 1998. 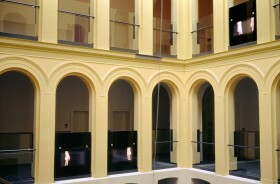 Instal­la­tion shown in the Kunsthalle Münster 2002. 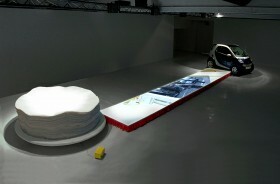 4 channel video instal­la­tion. 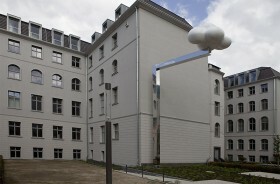 Exhib­ited 2005 at the Fundació Joan Miro, Espai 13, in the series Obses­sions, (zero % stan­dard), Barcelona/Spain. 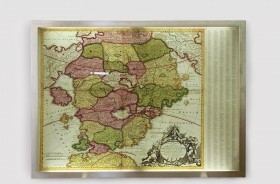 Histor­ical Chart of the Accu­rata Utopia Tabula (J. 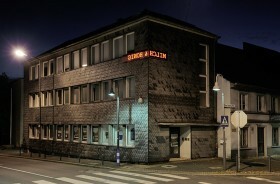 B. Homann around 1700) with complete index as a backlit slide in a light box, stain­less steel frame 195 x 145 x 3 cm, 2004. 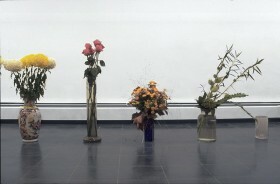 Thirty flower vases, donated by friends of the Kunstverein, for thirty days of the exhi­bi­tion. 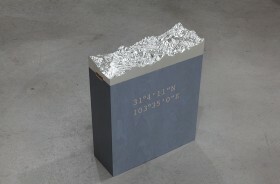 Kunstverein Eislingen 1995. 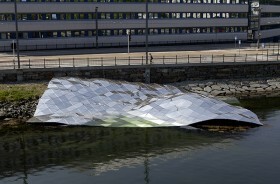 A rectan­gular, polished stain­less steel panel measuring 416 m² covers the stony shore of an inner city fjord with a small island. The panel is exactly aligned according to the earth’s coor­di­nate system and relates to the area between 60°22’52.55“N / 60°22’51.8“N and 05°20’01.24“E / 05°20’02.32“E. 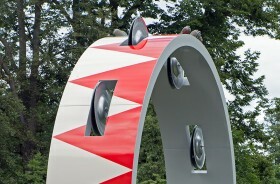 2010 designed for the Norwe­gian city of Bergen, installed 2012 as part of the Bybanen Art Program. 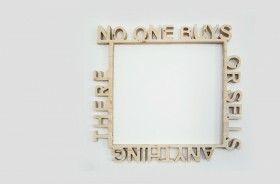 Mirrored LED text presented as part of the exhi­bi­tion project “Blick­wechsel” in North Rhine Westphalia—42 art projects in public space, 2011. 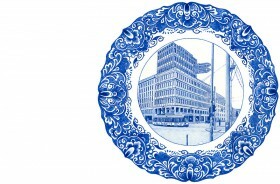 Realised in 2010 in the garden court­yard of the Federal Ministry of Food, Agri­cul­ture and Consumer Protec­tion in Berlin. 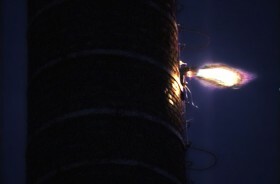 A vertical gasflame, realised as part of the exhi­bi­tion project “Auf zu den Sternen” (To the Stars) orga­nized by the Bran­den­bur­gis­cher Kunstverein from September 2000 to March 2001 on the Schiff bauer­gasse indus­trial site in Potsdam. 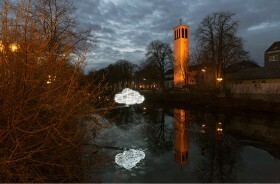 Designed in 2008 for the sculp­ture path “Licht­prom­e­nade” (Prom­e­nade of Light), realised in 2009 in Lipp­stadt, Germany. 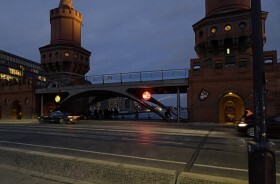 Film produc­tion for Pots­damer Straße in Berlin. Not realised. 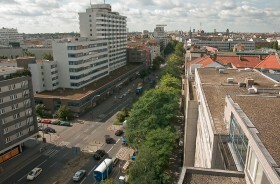 Winner of the 2005 compe­ti­tion “Pots­damer Straße—Künstlerische Installation(en) zur Kunst- und Kulturgeschichte” (Potsdam Street—Artistic Installation(s) relating to the history of art and culture). 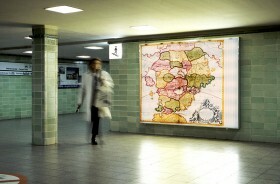 A large scale slide in a light box, 230 x 180 x 12 cm, at the Berlin S-Bahn station Unter den Linden, as part of the “trans­portale”, April – May 2003. 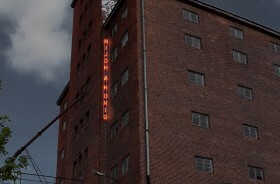 Lumi­nous red neon text spelling “Milch & Honig” in back-to-front letters in the old city harbour of Wismar. 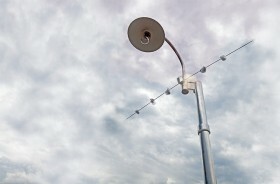 Installed in 2005 during “Zum Wasser—ins Licht”, Kunst im Stad­traum Wismar. (To the Sea—into the Light, Art in Urban Space in Wismar). 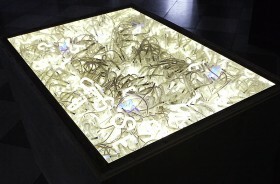 A steel profile frame with white and blue neon letters running around it and a round hole in the ground, realised as part of the Wies­badener Kunst­sommer “Wo bitte geht’s zum Öffentlichen?” (2006 Summer of Art, Wies­baden, Germany “Show me the Way to the Public Sphere!”). Realised in 2002 in the Martin Gropius hospital in Eber­swalde, Germany. 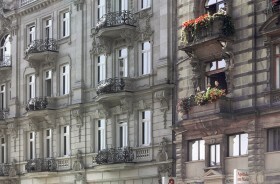 Commis­sioned by the Bernau State Plan­ning Office and the Bran­den­burg Ministry of Finance. 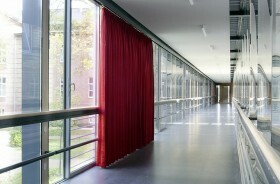 Five large flatscreens inserted between the pillars of the atrium of the Eber­swalde regional hospital show hands walking on their finger­tips. Realised in 2002 in the Martin Gropius hospital in Eber­swalde, Germany. 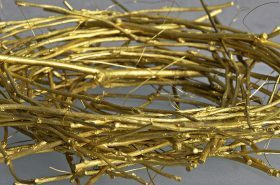 Commis­sioned by the Bernau State Plan­ning Off ice and the Bran­den­burg Ministry of Finance. 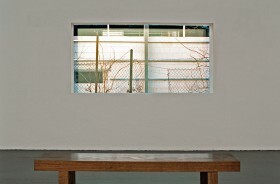 Glazed section, measuring 250 x 140 cm, of the brick back wall of the exhi­bi­tion hall of the Kunsthalle Münster, 2002, a visi­tors’ bench, construc­tion spot­lights mounted on the inside and outside. 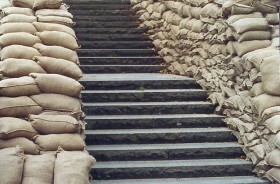 A protec­tive wall of approx­i­mately 1,500 sand­bags in front of the Kunsthalle, realised in 1993 on the occa­sion of the exhi­bi­tion “Kunst im Welt­maßstab” (Art on a World Scale) at Kunsthalle zu Kiel, Germany, as a Thomas Bauer project (Thorsten Gold­berg and Wieland Bauder).